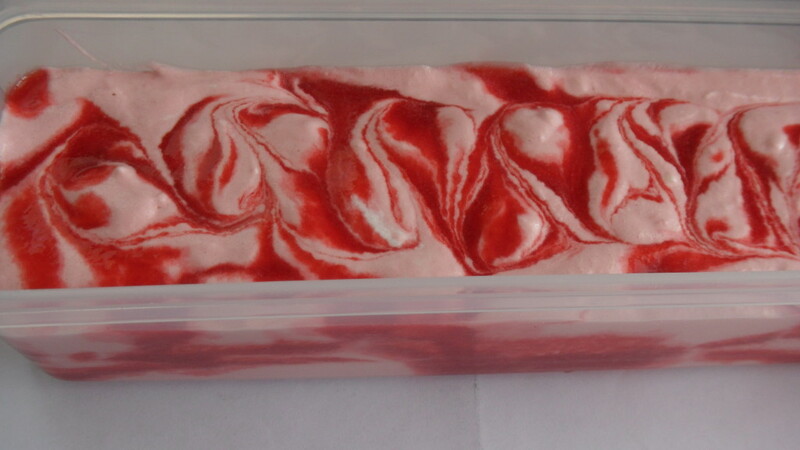 This semifreddo recipe by Belinda Jeffery has a lovely texture; it is smooth and creamy, and the flavour is deliciously intense with swirls of bright-red raspberryness. This semifreddo is cool and refreshing and is a great way to capture that true summer-berry flavour of raspberries. This is absolutely YUM! Semifreddo means ‘partly cold’ or ‘half cold’ in Italian. This Italian dessert is not quite an ice-cream (it is easier to make than a proper ice-cream) and it doesn’t set completely hard because of the whipped cream. 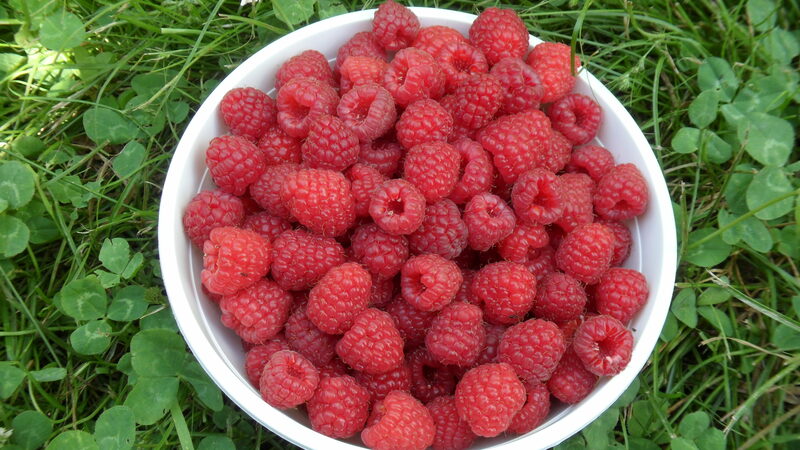 These are the freshly picked raspberries that went into the semifreddo, just a couple of hours after being picked – you can’t get fresher than that! I picked the ripest berries I could find on the canes at Ruby Glen Berry Farm in Napier. Read this recipe through first so you can get the equipment out and organized, and have an idea of the steps in the recipe. For example, steps 3-5 require beating the egg whites over hot water as when making a Swiss Meringue, and then cooling the mixture. Also, make sure the cream is softly whipped so it blends into the fluffy egg white and berry mixture and folds in nicely without leaving any clumps of cream. The raspberry puree in this recipe is sieved to remove the seeds as most people don’t like the seeds caught in their teeth. I prefer to sieve the puree, but you can cut this step out depending on preference. Puree the raspberries and any of their juices in a blender. Pour half the puree into a large fine sieve sitting over a bowl. Use a spoon to rub the puree through the sieve to remove the seeds. Scrape off the underside of the sieve as you go since a lot of puree collects there. Now do the same with the other half (if your sieve is really big you may be able to do this all in one go). Measure out 150ml of the strained puree, reserving the remainder. Using a hand-held electric beater, beat the egg whites in a large heat-proof bowl (stainless steel is ideal) until they are just fluffy, then beat in 1/8th of a cup (27g) of the sugar, a little at a time, beating well between each addition. Be very careful at this stage: – place the bowl over a saucepan of simmering water and continue to beat the whites, adding the remaining sugar a little at a time. (Watch the cord of the electric beater near the cook-top, and the unsteady bowl). Keep beating until the mixture is thick and fluffy and the sugar has dissolved, about 6 minutes. Remove the bowl from the heat. Stand the bowl in a larger bowl, or a sink, filled with plenty of ice and continue to beat the mixture until it is cool. Whisk in the 150ml of raspberry puree. Once that’s well combined, fold in the whipped cream. Scrape the mixture into a freezer container, splotching a little of the reserved puree here and there as you go. You may not need all the berry puree for the semifreddo, and any leftover makes a nice topping, or garnish. 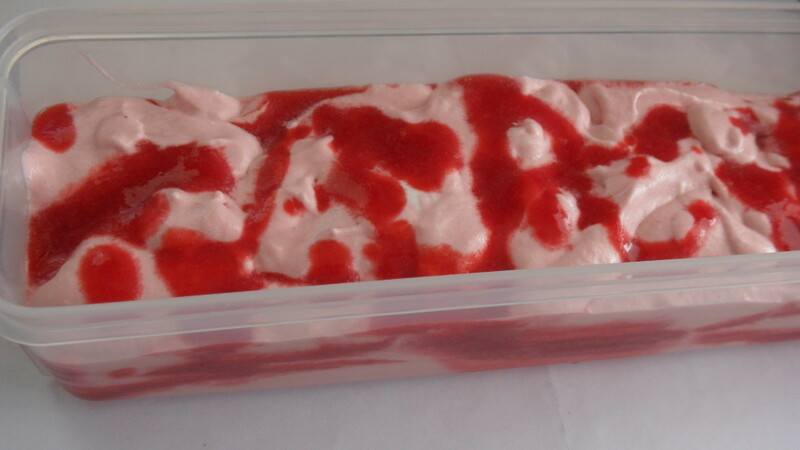 Swirl the mixture with a skewer or knife blade a couple of times to give the semifreddo a berry ripple effect. Cover the container and freeze overnight. Add a little icing sugar to any remaining berry puree to make a topping and chill it in the fridge. SERVING SUGGESTIONS: Serve the semifreddo onto chilled plates or bowls as it melts quickly. 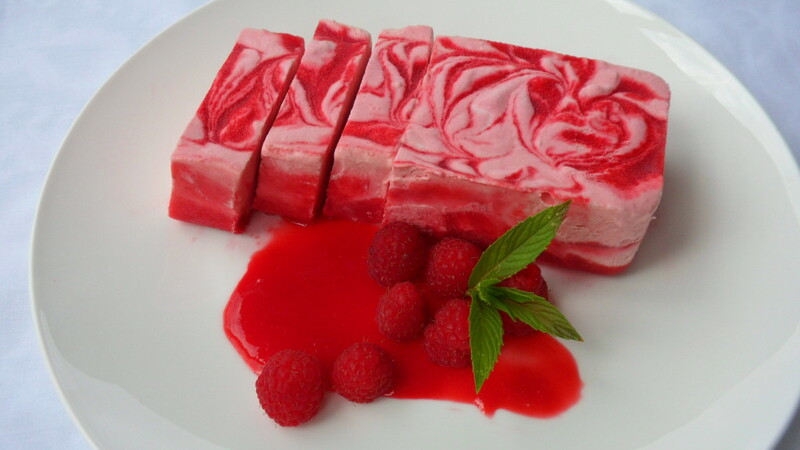 Serve with the remaining sweetened raspberry puree, whipped cream, and some fresh raspberries. In one of those happy little circumstances, we discovered that the semifreddo goes well with a sparkling white wine. 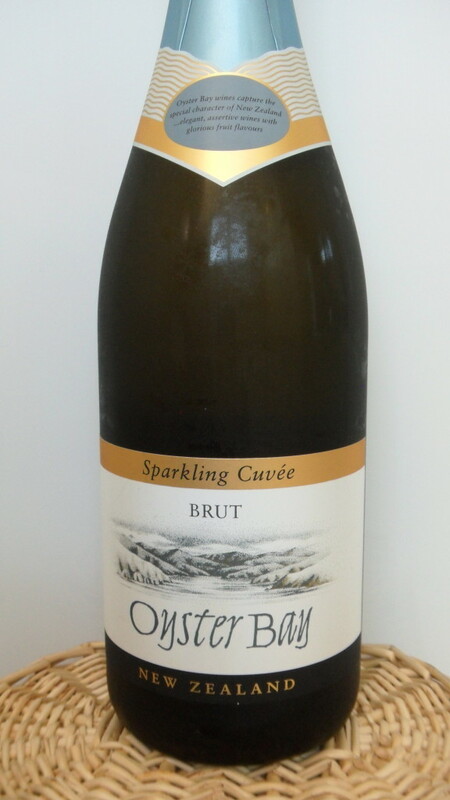 We had Oyster Bay, Sparkling Cuvee, Brut, from the Marlborough region of New Zealand (near Blenheim), and we popped a few fresh raspberries into the wineglass as well. Camberwell, Victoria, Australia: Lantern, 2012. This book collects Australian cook Belinda Jeffery’s favourite recipes.